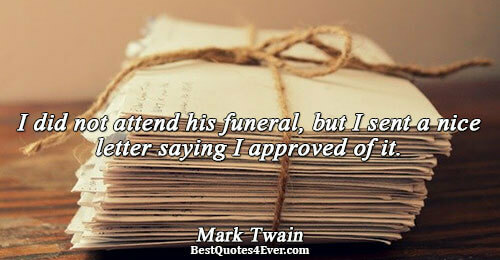 I did not attend his funeral, but I sent a nice letter saying I approved of it. My ghost is the only soul who ever comes to cry on my grave... Only the skies cried sincerely on my funeral. I want words at my funeral. But I guess that means you need life in your life. The more death, the more birth. People are entering, others are exiting. The cry of a baby, the mourning of others. When others cry, the other are laughing and making merry. The world is mingled with sadness, joy, happiness, anger, wealth, poverty, etc. Your coffin reached the monstrous hole. And a part of me went down into the muddy earth with you and lay down next to you and died with you. I remembered back to leo's burial and holding your hand. I was eleven and you were six, your hand soft and small in mine. As the vicar said 'in sure and certain hope of the resurrection of eternal life' you turned to me, 'I don't want sure and certain hope I want sure and certain Bee. It's important to attend funerals. It is important to view the body, they say, and to see it committed to earth or fire because unless you do that, the loved one dies for you again and again. Western funerals: black hearses, and black horses, and fast-fading flowers. Why should black be the colour of death? Why not the colours of a sunset? Thanks. - So fine a time! Good night. The face of the dead man was concealed, of course, our customs not being those of the south, where corpses are carried to the grave in open coffins, that they might – one last time before slipping into the pit – be warmed by the light of the sun. A funeral is no place for secrets. I think she might at least have waited till the funeral was over,' said Amanda in a scandalized voice. Anyway, they took her body to McBurney's Funeral Home in Motley. They'll be planting her tomorrow. I'm telling you, Augustus Waters talked so much that he'd interrupt you at his own funeral. She hath no questions, she hath no replies. It was very sad under the trees. Although spring was well advanced, in the deep shade there was nothing but death-rotten leaves, gray and white fungi, and over everything a funeral hush. My life will end someday, but it will end at my convenience. He is but as the stubble of the field, and yet he has no beard.